My name is Jank Klouček and I have been manufacturing pipes professionaly under the trademark JanPipes since 1999. My path towards the pipemaking craft was not direct. First I studied mathematics at the Charles University and after that I was doing business. 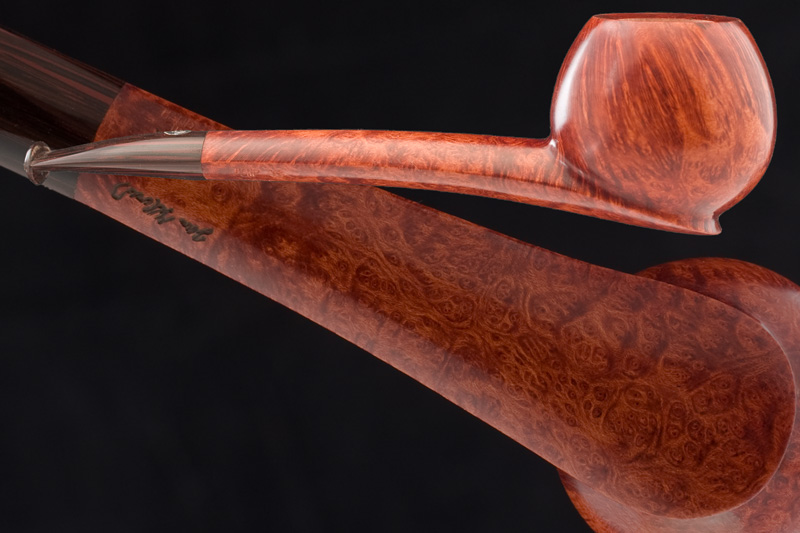 In 1992 I founded the pipeshop „Baker Street“ in Celetná street in the center of Prague – this was the breaking point of my life which lead me to professional pipemaking. Later on I had the honor to learn the pipemaking craft right in it's cradle, the French city of Saint-Claude. Cooperation with the prominent French pipe firm Chacom was very important for founding my own workshop. Mr. Yves Grenard, the owner of Chacom, helped me very much with starting the pipe business of my own and was also my main expert adviser. Perfect skills within the craft and knowledge of the material are matters that I consider to be the basics for a quality manufacture of freehands. That's why series of machine made pipes were the main workload in the early days of my pipe studio. Only after gaining enough experience did I dare to start with the design of the first author pipes of my own. Sources of my inspiration these days are architecture, nature or purely technical motives. The shapes of my pipes are often very distinct but still strictly functional. 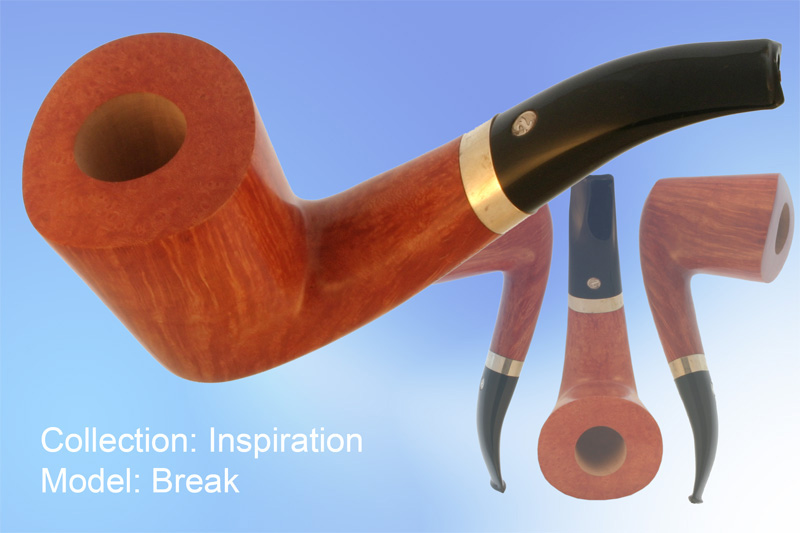 In the beginning I liked to characterize the shapes of my pipes as „Baroque funktionalism“. Today I look back at my early pipes with a critical eye but some shapes remain unchanged and valid even though a lot of time has passed since then. Surely one of these shapes would be the competition pipe for the Barcelona Pipe Club, the Wankel, then some newer shapes: Souche, Poker Esta, Hot Vulkan, Quadra and Break and Spoon and Dragon of Brooklyn. I made an interesting Cocon set which was one bent and one straight pipe for my home pipE-club Dymka.net. Also I must mention the seven pipe collection Gaudí Dreams which is also connected to my beloved Barcelona. Finally I hope that I have successfuly prepared the competition pipes which I had the honor to make for the event of the World championship in Mariánské Lázně 2006. One year later in 2007 I had my first personal meeting with Bill Ashton in England. This meeting and the discussion we had opened and rediscovered for me the field of classical shapes which I try to slightly enhance these days. It's one of the directions that I would like to pursue for the future. For a greater diversity of my work I like to use other materials like olive wood and morta oak. Sometimes I experiment even with some other materials for rings and aplications. These are allways made of natural materials such as horn, many kinds of bones or walnuts. The stems of my current pipes are hand cut from ebony or acrylic bars. As for metal sometimes I even use mokume, but my most favourite aplication still is a plain silver ring which already might be quite typical for my pipes. Another integral part of my life and the life of my pipe studio are amateur pipe workshops since 2006. First I held these jusf for my friends from the pipe club but over the time the scope became international. This way I try to offer pipe smokers a chance to experience the whole process of pipemaking and even make a pipe of their own. Along with this the pipe studio in Kostelec became a meeting point for other Czech professional pipemakers and I intend keep this open approach for the future. Meeting colleagues means not only pleasently spent time but also an opportunity to discuss the mysteries of pipemaking. Often it is also a mutual friendly chalenge and an inspiration for further work.